Heavy rains in previous weeks have washed soil away from developing roots in some fields. Plants now up to 4-5 leaf stages in affected areas are hanging on by the main radical root. Some plants haven’t been able to survive while others have. Looking closely, brace roots are developing at the crowns of affected plants and eventually, they will begin to kink themselves to pull the plants upright again. There’s not much to do in this situation, but if you have the ability to get soil built up around the root base by cultivating, that can help. If not, an irrigation or rainfall may also help. Often I see rootless corn syndrome as a problem with smaller plants-3 leaves or less-in which the seed was planted shallow to allow for planting in wet soils. Windy conditions and lack of soil moisture near the surface can allow for poor root development leading to rootless corn syndrome. Thus, I recommend planting corn 2″ deep and not planting shallow to avoid this problem later on. 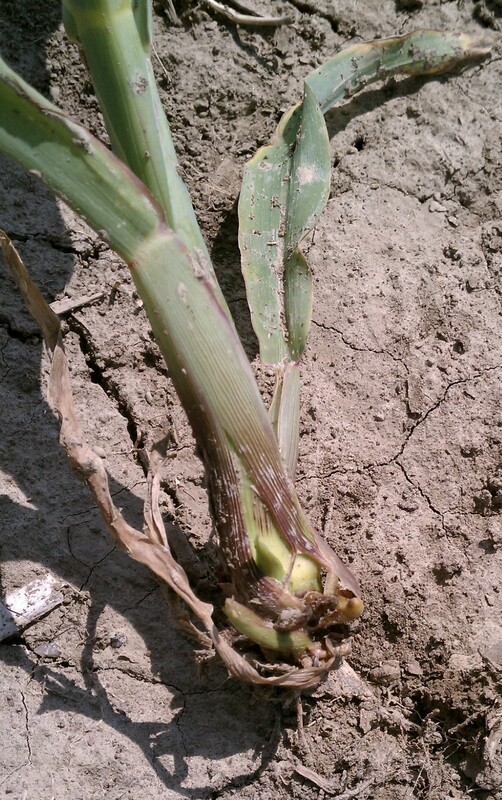 Posted on June 14, 2011, in Crop Updates and tagged Agriculture, corn, Crops, Nebraska, Rootless corn syndrome. Bookmark the permalink. Leave a comment.